Labrador training isn’t difficult if you know what you are doing. That is why so many first time dog owners struggle with this element of owning a dog. It is essential that you take your Labrador to be taught at a proper obedience school, so you can gain the confidence you need to effectively teach your Lab how to be the best he can be. Below are tips that can help you with your Labrador training adventure. Every time your Lab successfully eliminates outside, praise him as if you’ve just won the lottery. Obedience class – Enroll your Labrador in obedience classes as soon as he meets the age requirement. Proper obedient training from a qualified dog instructor will help you build the confidence to train your dog, which will help your Labrador take direction from you. 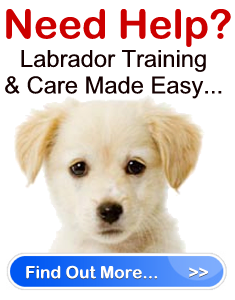 Training consistency – Labrador training needs consistency. This means using one word commands and the same hand signals when training. The more repetitious you are, the faster your dog will learn. In addition, don’t forget to take breaks when training and make it fun. Your dog has a limited attention span. Discipline – No dog is perfect, and there will be times when your Labrador will frustrate the life out of you and try your patience. This is when you need to enforce discipline. However, this doesn’t mean you should shout at your dog. When your Lab does something you dislike, look him straight in the eye and say in a firm tone “No”. Show him how to properly do as you asked, and then praise him immediately to help him understand. Remember, discipline needs to start at puppyhood. Note: Never hit your Labrador! Praise, Praise, Praise! – When your Labrador listens to your commands and does things that please you praise him over and over again. He’ll never get tired of hearing it, and will only be more devoted and determined to do things the way you like it. Proper obedience Labrador training is the best thing for your dog. That being said, there are other things you can teach your dog that you don’t need a class for, such as swimming lesson. 1. Choose a warm day and take a trip with your Labrador and another person to a pond or lake. Make sure the water is calm and that you are wearing bathing gear or clothing you don’t care about. You will get wet. 2. Pick up your Lab and take him out into the water with you. Stop when the water has reached your thighs. The other person should wait on the shore. 3. One hand should be securely placed at the base of your Lab’s tail, and the other supporting his tummy. Gently talk to him as you lower him to the water, and do not release your hold even when he makes contact with the water. 4. When your Lab makes water contact he will immediately start to move his paws and paddle. Give him praise when he does this to encourage him to continue. 5. Once he has some strength to his paddle, take your hand from under his tummy, but do not let go of his tail. Keep your hold so that his backend is level with the front. Continue giving him words of praise. 6. As soon as you think your Labrador is ready, tell the other person to start calling him. Let go of your hold on his tail once you feel him paddling stronger. Follow him closely while he swims to the shore just in case you need to rescue him from the water should he stop moving. 7. Lavish him with high praise and give him a treat as soon as he is successful at reaching the shore. 8. Repeat the lesson and each time increase the distance from the shore.